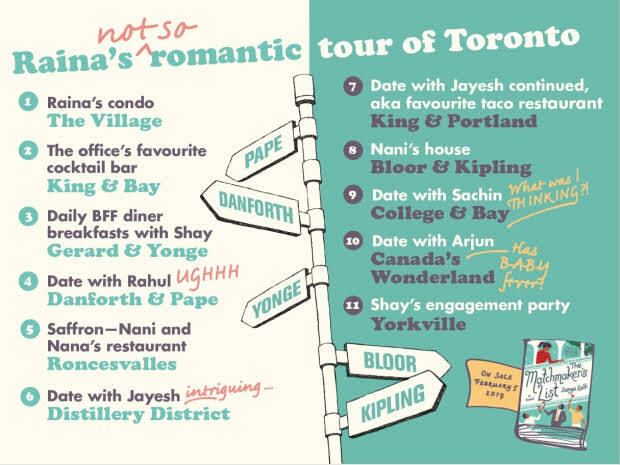 Sonya Lalli's new novel, The Matchmaker's List, is set in Toronto, Canada. I don't often come across novels that take place in my own hometown, so it was fun to read a novel and be able to visualize the city so well. My favourite place in The Matchmaker's List is actually somewhere the characters never visit on page: Saffron, Nani's restaurant in Roncevalles. There used to be a scene featuring Raina and her Nani at Saffron in an earlier draft of the book, so I have the whole thing mapped out in my mind. It’s right on Roncesvalles Avenue, probably sandwiched between a wine bar and a yoga studio, and tastefully decorated. There would be low light, only have about a dozen tables, and the food would be incredible but not too expensive. (Reasonable for downtown Toronto, at least!) It would be the type of Indian restaurant where you could go with coworkers for lunch on a weekday, or after work on a date, or even with your family and kids on a Sunday afternoon. It would be personal, and friendly and vibrant — just like Raina’s Nani. Cooking plays such a big role in Raina’s and Nani’s relationship, and I think Nani’s restaurant is somewhere Raina would feel very at home. In the deleted scene, Raina picks up Nani from Saffron after work because of bad weather, and she doesn’t want her Nani to drive. Going inside to fetch her, Raina looks around and smiles, and thinks back at all the other restaurants her grandparents had run over the years. How they started as immigrants with not very much, and worked hard to gradually grow their business. Two fun facts. One: my real-life Nani is an excellent cook. Two: I named Saffron after a fantastic Indian restaurant that was across the street.